Open file backup allows taking “hot” snapshots of files (or entire drives and partitions) used by other software, without stopping these processes. Handy Backup allows backup open files by using the VSS (Volume Shadow copying) service provided by Windows to access files locked by other programs. “Hot” open files backup allows continuing any daily and routine operations over file open by other application when backing up, removing both distractions of users emerging by the need to stop their jobs during backups and also operational mishaps and malfunctions due to stopping and restarting. An extension of the previous feature, the open file backup technology allows taking images of entire drives (both for physical computers and for virtual machines) without stopping an OS running on a source drive. This feature makes possible taking complete snapshots of a running OS “on the fly”! When Windows backup open files, it is a method to run a data-saving task at an exact time (or by exactly specified event) without any additional operations such as stopping collateral activities over these data. Open file backup technology helps always executing a pre-planned job, regardless of circumstances. The Professional edition serves as open file backup software for all typical data utilized by expert users, workstation operators and IT pros throughout the entire world. Free 30-days trial! As mentioned above, the VSS service is a crucial technology used for open files backup. Therefore, a user who runs Handy Backup Client must have enough rights to start this service on a computer. 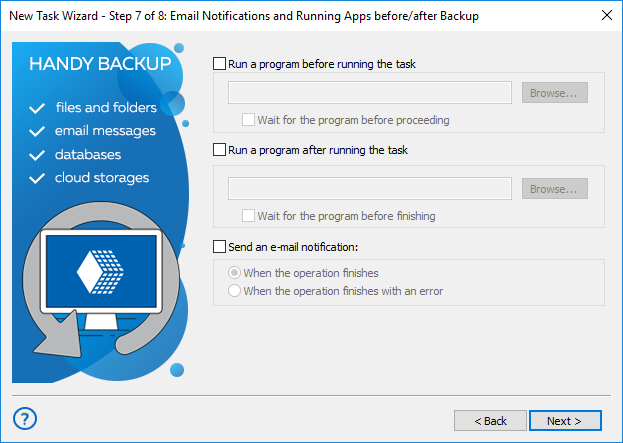 Handy Backup requires no additional privileges, actions or settings to backup open files. Caveat! Open file backup is a default option for most Handy Backup data sources, including files, databases1, virtual machines and entire drive images. To avoid backup open files (if you need it for some reasons), you must stop any software instances operating with source files! Sometimes, you can feel undesirable to make open file backup over some data. To override default Handy Backup capabilities of taking “hot” snapshots automatically, please set up stopping your file-locking software before a task and then restart it after a task on the Step 7. 1 For the generic “Database” plug-in, a possibility of open file backup depends on capabilities of a corresponding ODBC driver for a particular database. 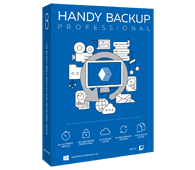 Any edition of Handy Backup helps Windows backup open files via VSS. In network editions, the Network Agents allow open file backup on remote machines. Any version of Windows containing VSS, e.g. Windows 10, 8, 7, Vista and Windows Server, allows backup open files. by downloading and installing a newest edition with all features and plug-ins for a 30-day free trial period!